Nit Free TERMINATOR Comb is the ultimate Tool to fight Head Lice and their eggs (nits). ANTI-SLIP BANDS allow for better gripping and control. ADVANCED LASER TECHNOLOGY welding make the comb sturdy and long-lasting. MICROGROOVED TEETH consist of microscopic cutting edges that are positioned along the teeth in a tight spiral form These cutting edges, together with the dragging action of the teeth, remove even the tiniest nits, used with all types of hair. For more information email us at: info@nitbusters.com. Stainless steel comb with micro-grooved teeth. 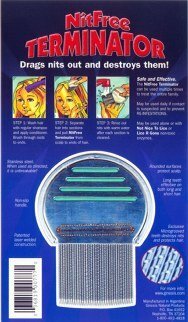 Removes lice and nits safely. EASILY COMBS NITS OUT OF HAIR, WITHOUT HARM TO HAIR! Used in all types of hair. Safe and Effective. The Nit Free Terminator can be used Multiple times to treat the entire family. The Stainless steel construction is unbreakable when used as directed. #1 Lice Comb used by Professional Lice Removal Services! Lifetime Guarantee. My daughter and children had a lice problem that seemed impossible to eradicate. They tried just about every remedy they could find, but nothing worked. Then they found a professional lice removal person and this is the comb she used in her business. She charged a lot of money for her services, but one could also just buy the comb. Unfortunately, she ran out of combs to sell, so my daughter searched and found the comb here at Amazon. I have tried all three of the so called best lice and nit removal combs on the market and the Nit Free Terminator Comb is by far the most effective. They all get out lice but this comb really gets the nits (lice eggs) out much more efficiently. The Rid comb and the LiceMeister were not as effective at all. This is without a doubt, the best comb on the market. It will not pull out every nit, but if you have a bad infestation, you can save yourself literally HOURS of time. It will get alot of the nits without picking, and then you can look for and pick out the leftovers. This Comb Is The Answer!!! After getting over the shock of our kids coming home from school with lice, the best solution we found is definitely the Terminator Lice Comb used in conjunction with Cetaphil Skin Cleanser. At first, we tried the RID shampoo from the pharmacy which included a fine comb and gel. This did not work since nits hatch a day later and you cannot use the shampoo over and over. The shampoo has a pesticide in it that can be very dangerous for children. After researching information on the Internet, the process we used that got rid of the lice within four days was the following: 1) wash hair and put conditioner in and leave it in, 2) comb hair with regular comb to get knots out, 3) section off hair and use Terminator Comb on each section (note: make sure you rinse Terminator Comb off after each stroke as to not spread lice, nymphs or nits), 4) completely rinse out hair conditioner and blow dry hair. STEP 5) before bedtime, saturate hair with Cetaphil Gentle Skin Cleanser all the way to the scalp. Put shower cap on child for the entire night. This step is important since the Cetaphil seems to keep lice and nymphs from crawling around and probably blocks the nits from hatching. However, this is not confirmed but makes sense if you read how nits hatch. Rinse the Cetaphil out in the morning and repeat combing hair with the Terminator Comb. The ONLY lice & nit comb that works!